Wi-Fi Direct (also known as Wi-Fi P2P) is an extension of the 802.11 stack, allowing compliant devices to communicate directly, without requiring their disconnection from the main access point. The technology re-uses many existing standards and can be seen as the capability of a wireless device to have multiple logical interfaces in different modes, including some in master/softAP mode with WPS. Wi-Fi Direct attracted the interest of gadget device makers, as it allows to re-use existing network cards to connect external devices wirelessly and without the need for an additional dongle. One of the first device to appear on the market is the HP Wi-Fi Direct Mouse… Want to see what makes it tick? Keep reading! The most common platform for modern PC wireless gadgets is the Nordic nRF series of 2.4GHz radio ICs. This is a very low power radio device made by the Norwegian company Nordic Semiconductor, available both as a standalone SPI radio and as a 8051 or Cortex-M0 based SoC. nRF devices use a simple 2.4GHz GFSK based proprietary protocol up to 2Mbps. They are very easy to use, require very little memory for the radio stack, being therefore well suited to implement simple gadgets, if you accept the fact that for PC gadgets you also need to develop and manufacture an appropriate USB dongle and nobody likes dongles. Also, Nordic SPI radio documentation is freely available, so it’s hobbyist friendly. On the other hand, there is Bluetooth that supports natively HID devices like mice and is already available in most middle to high-end laptops. The main drawback about Bluetooth mice is latency: most bluetooth mice have really poor response to the device’s movements, which is frustrating for the user and makes those devices less than useless for gaming. The only exception is the Apple Magic Mouse when used on Macs, but it’s probably using some proprietary extensions to perform decently. Wi-Fi Direct is a relatively new technology for gadgets and the few devices available have received many negative feedbacks from the users (early adopters always get all the fun…), probably due to the poor quality of both host side wifi-direct drivers and stack, but the device I’m testing looks really responsive and usable. Time to take it apart! First of all, as many big companies, HP does not design this kind of small devices on its own. The Wi-Fi mouse is designed and manufactured by a Taiwanese 3rd party, Primax, as confirmed by the OUI number (38:0d:d4). The device is very friendly to dismount, as no warranty labels have to be broken or cut in order to remove the upper chassis. 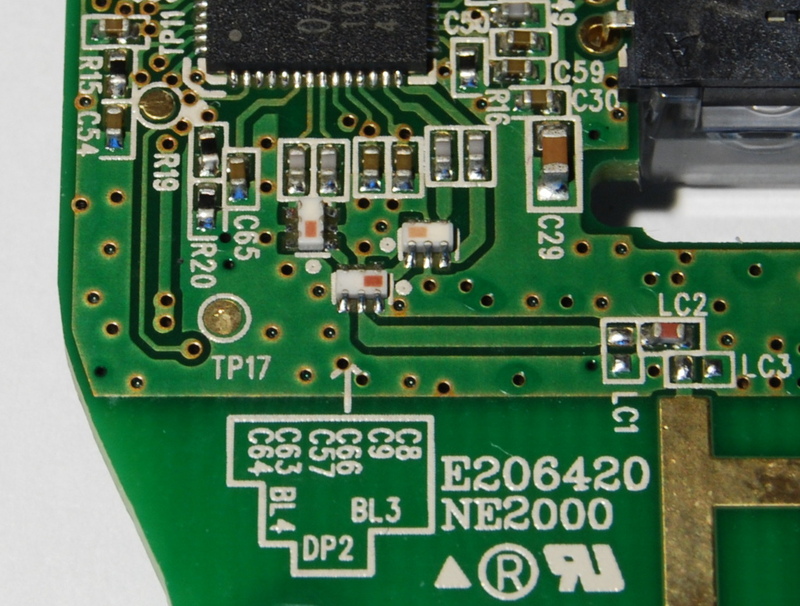 This is the device PCB housing all of the active components of the mouse. 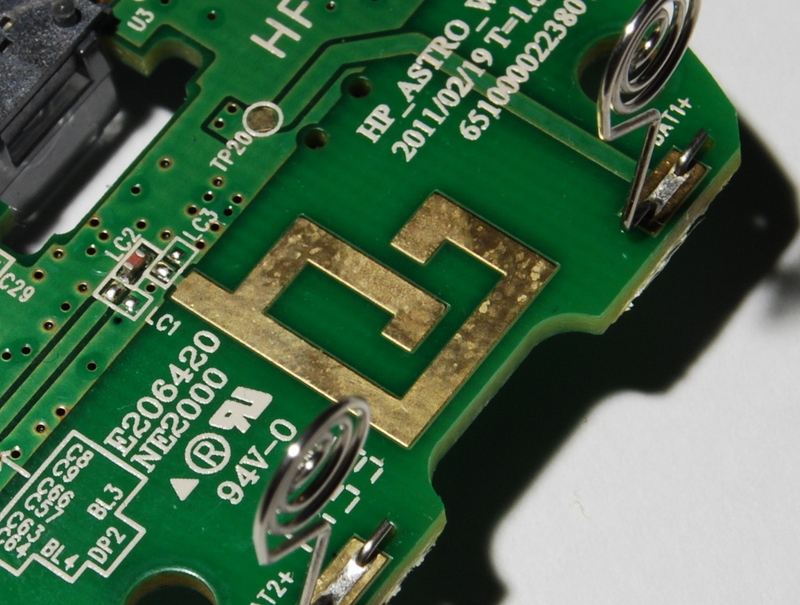 The PCB itself is a standard 1.6mm dual layer design. They seem to be a boost converter (U4), bringing the battery voltage up to 3.0V, and a buck converter (U5) taking the voltage down to 1.8V. The mouse thus has two stable power rails using relatively efficent converters powered by the unregulated voltage of the two AA batteries. 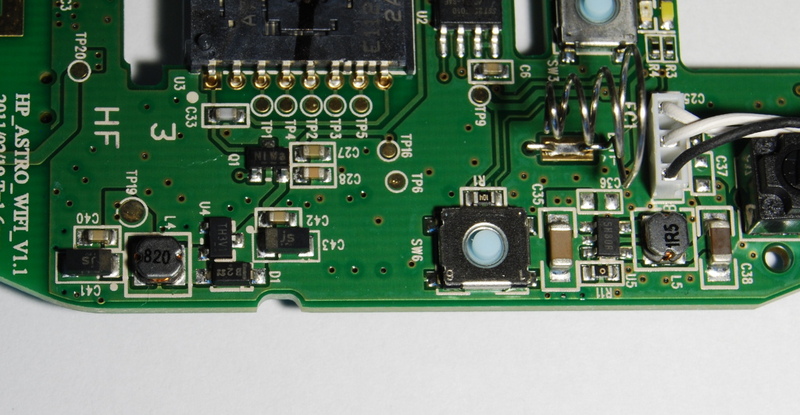 At the center of the mouse there is the optical laser sensor, an Avago ADNS7530, with a VCSEL laser, a SPI interface and a 2.7-3.6V supply. In the picture above you can see the laser driving MOSFET (Q1). 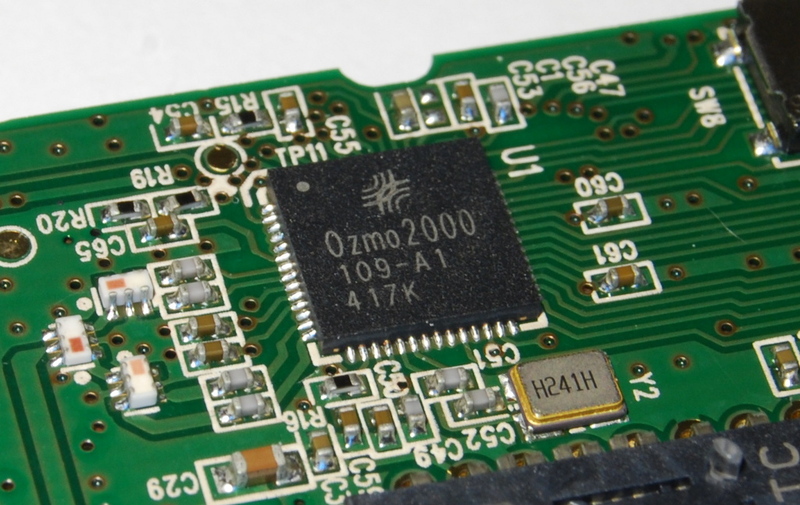 Finally, the main controller of the mouse is the OZMO2000 IC in QFN56 package. Ozmo Devices is a Californian Fabless IC manufacturer founded in 2004 and recently aquired by Atmel. The company focuses on Wi-Fi based PAN products and OZMO2000 seems to be the only released IC so far. 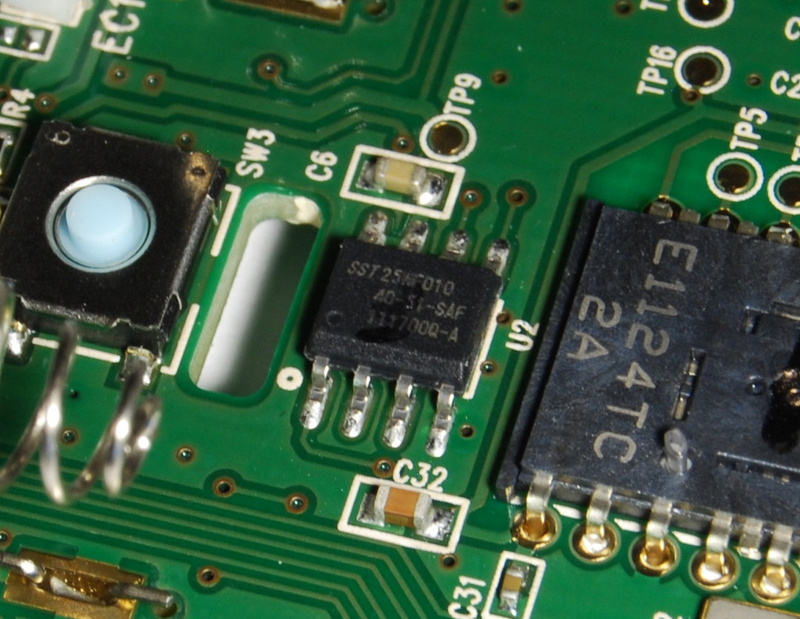 The IC is fed with a single 24MHz clock and a single 1.8V supply and is connected to a single SST 25WF010… 1Mbit SPI Flash memory, probably used for both device firmware (OTA upgradable!) and configuration. 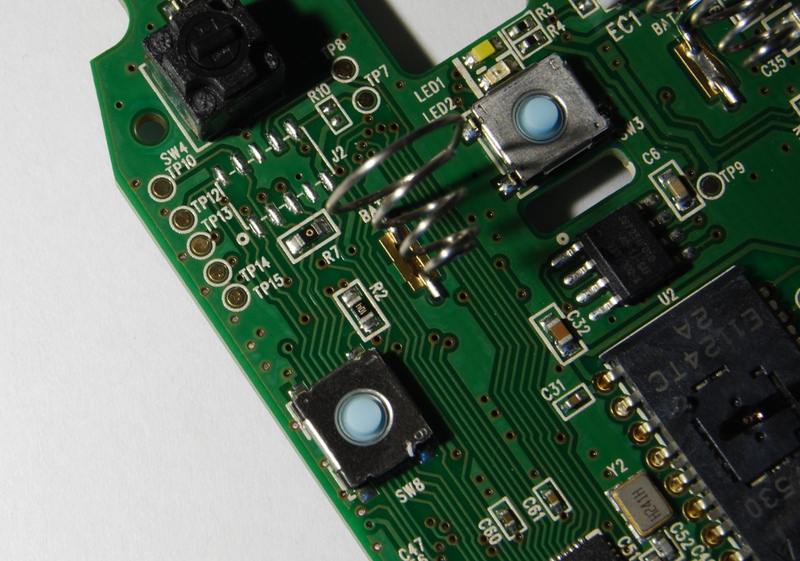 On the top left side of the board there is what looks like a non populated 1.27mm 2×5 SMD header socket, with all signals duplicated on test points. 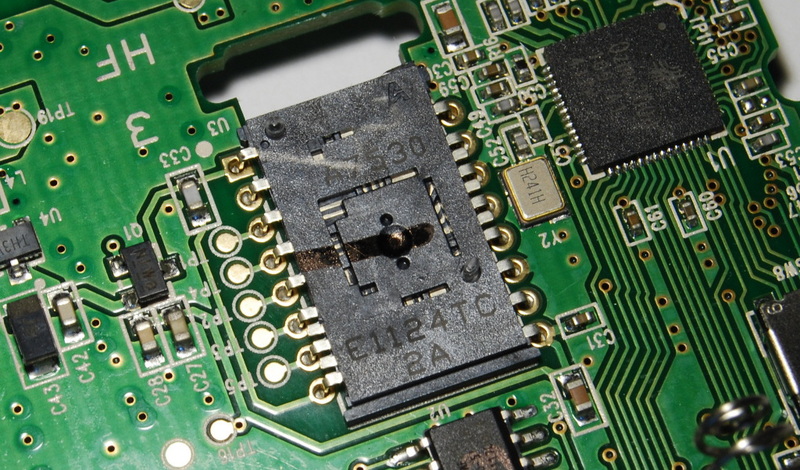 This is probably the main IC JTAG debug and programming interface and while the connector is used for firmware development, test points are there for the mass production. The RF section is on the bottom part of the device, with the signal adaption electronics and the antenna itself. This is probably the most interesting part, as it turns out that the OZMO2000 has a dual band radio capable of operating on both 2.4GHz and 5GHz Wi-Fi frequencies. This should not come as a surprise since, when used with Wi-Fi Direct with a PC already connected to an Access Point, the mouse has to function the same frequency as the main AP connection. The RF matching network is composed by two SMD balun, BL3 and BL4 (see the silkscreen), that are fed with the balanced output from 2.4GHz and 5GHz radios. The two unbalanced signals are combined together by the diplexer DP2 and fed to the antenna. The antenna itself looks like a quite simple dual band folded monopole design (again – I’m not an antenna expert so feel free to post a comment if I’m wrong! ), as you can see by the two monopoles tuned for different frequencies. The two monopoles are sized reasonably for 2.4GHz and 5GHz quarterwave antennas. Despite the antenna placement on the back, under the palmrest, the mouse seems to have an amazing range… much more than you actually need. Well done Ozmo! Despite having tested the device only for a couple of days, I’m really happy with its performance. The latency of the mouse is really good, one of the best wireless mice I’ve ever used… and I’m really not a wireless mouse fan. 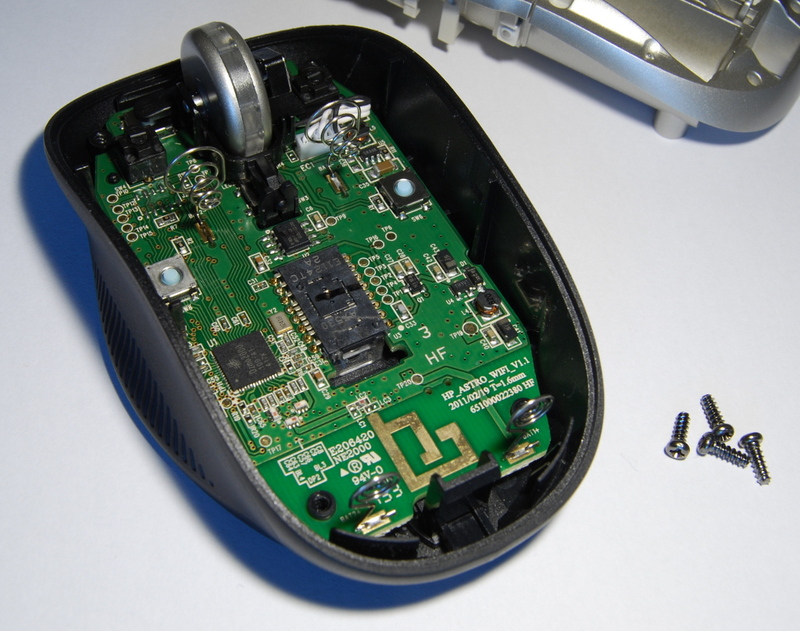 In fact, I’ve originally bought this mouse just to take it apart, but it turns out to be a really cool device! The only problem I’ve been experiencing is some random disconnections (that I hope to fix with a firmware upgrade) and a relatively long association time from standby (not much can be done here…). On the software side, the mouse is only supported on Windows 7 with certified Wi-Fi card, which is really bad… because it’s a lie! The device works with any supported Wi-Fi Direct card in Linux, including many iwlwifi and ath6k/ath9k based cones. You’ll also need a recent version of wpa_supplicant and a custom kernel with proper options enabled. More about that on my next post! Congratulations also for the very detailed description of the internals, you should put this on ifixit.com! I used one of these HP mice with Win7 every day for over a year. Best wireless mouse ever! Nice teardown article. Thanks! Unless otherwise stated, this work is licensed under a Creative Commons Attribution-ShareAlike 3.0 License.